Funny lines, things that amuse you, hard to get scenes, the whole nine yards. What are some of your favorite parts? I think this may be my favorite tidbit of background story. I honestly hope this means Julianna totally ignored his advances and then wooed his sister right in front of him. Or Julianna totally ignored his advances while Brin seduced her away. Hah, mind you, ambitious as Banion is, and the fact that Brin and Banion seem pretty tight (not Corisande and Kivan tight though) I could see the southern siblings making an offer to Juliana similar to the one that Elodie can get. Marry the brother to love the sister. Though checking some let's play, apparently Bannion did not have a single clue about that. But then again, Julianna found Brin 'too challenging', and Brin gleefully helps a mage-hunting Elodie roosting out Selene shows that those two did not end well. I like how that information stays on Banion's dossier for the entire game. I was surprised recently to learn that you could face an assassin at the Festival of the Good Lady if you wrote to Charlotte about her powers. It makes sense, though: not only has Elodie already claimed her mother's crystal, but she knows about Charlotte's powers and potentially thinks one of her parents is a Lumen? Oh heck no. Lucille won't have any of that. This is a pretty minor thing, but I find amusing when Elodie talks her way into the Treasury room with a high level in accounting skill. Makes me laugh imagining her going on a non-stop tirade about economic nonsense and making the guards confused enough to let her in. First, it seems that you have the option to brush off Lucille's advice in a Dead Joslyn scenario if you're already engaged to Talarist. You can either continue planning for the wedding quickly, or delay it longer. I tried it within the same file, and it seemed like the only difference was whether I got the "pomp and splendor" version of their marriage or the "Talarist dotes on his kids" version...? Of course, this is also a file where Lucille becomes the Duchess of Merva, so I haven't explored all my options there. I'm unsure if this same choice comes up for any other scenario where Elodie is already engaged, as I haven't tested those yet. Second, in a Very, Very Bad endgame scenario, I've seen two different epilogue reactions to Joslyn dying in the duel and the entire Mervan ducal family being executed -- something that in itself is a rather obscure thing to accomplish. Another person showed screencaps of the aftermath, in which Elodie put Caloris and Merva under the crown's direct control. Every other noble opposed her on this, and facing a possible rebellion she elevated minor lords and ladies into the duchy. In my own playthrough, however, the nobles cautiously agreed to let her hold onto the duchies, so long as she gave up control to replacement Dukes/Duchesses as soon as possible. Merva still ended up seceding, however. (The screencaps of the first reaction didn't cover the whole epilogue, so I don't know if Merva seceded there as well, too. I wouldn't be shocked if they always do so if the entire family gets executed...) Maybe the difference is in noble approval? I haven't tested this, either. Third, I managed to drain the treasury funds badly enough to afford only a small feast for the coronation. The very first thing the epilogue told me was that the rush to claim what little food there was resulted in a stampede that killed several people, marking her coronation with tragedy. Now that's very interesting. 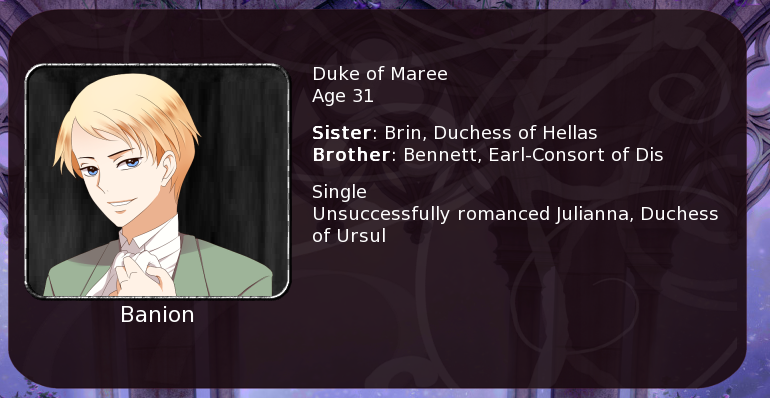 When I chose to delay the wedding to Talarist in my playthrough, I ended up with the Earl of Pastries, just missing the line about their children. But I was also hexed by Lucille, so that might have been a factor. I'll have to try a run where she's the Duchess or dead. I've also been engaged to Adair and Thaddeus when Lucille has come to visit. With Adair, you get the epilogue about them becoming close companions whatever you choose (since you'll marry Adair later on anyway), but there's an extra slide about how the royal couple deals with Elath's need for heirs if Elodie is infertile. With Thaddeus, you get the normal epilogue if you choose to have the wedding the next year, but if you delay, Arisse says "NOPE" and makes you have the wedding the next year anyway. I don't know if there's an extra slide if Elodie's infertile, since I think Lucille was Duchess of Merva in that playthrough. I don't know what kind of epilogue you get if you delay your wedding with Banion. There was a bug at some point where delayed marriages to Talarist could end up never happening, but that should be fixed. It does. I tried it out again and got both the normal and the barren epilogue slides. Though it reminds me of a question I have: does Talarist stay Duke of Sedna after his marriage, or does he give up his title like the other time he becomes part of the Novan court? I was recently surprised to learn that Linley can become Duke of Elath if you have the Duke of Kigal pick one of his children to replace Adair and that Sabine can compose a song in Joslyn's honor if he dies fighting Togami and Sabine isn't occupied investigating the chocolates. I don't think either of those are new to the new update, but it's the first time I've seen either scenes. I'm amazed at how a single easy-to-miss scene can sometimes completely change my view on a character or a situation. Ah... I think I may have figured out something? Granted, it's mostly all speculation. "Since their recent revolution, the Tombulans have twice begun gathering troops on the Novan border. Both times, their camps were struck by fierce storms and earthquakes, and they decided to give up on the idea." Maybe I'm looking too much into it, but I got the impression that Julianna was protecting her territory (or possibly Nova as a whole) by scaring away the Tombulans whenever they got too close. And if she ends up dead, there aren't anymore sudden earthquakes to keep invaders out. To be truthful, I think I might be a bit influenced by another fan's theory I read about Tombula that was more or less the same thing (the difference being that it was Fidelia summoning storms). But I like to think of Julianna having so much time trapped in Ursul because of anti-Lumen sentiment outside her territory that she can devote to chasing off potential invaders. Speaking of anti-Lumen sentiment, I got one of the Fun New Epilogues not too long ago. and by fun i mean someone please save Charlotte from mobs trying to drown her... she is too good for this sinful earth. Another Fun New Epilogue I finally figured out how to get gives some in-game proof that Lucille intended to kill Laurent, too. Something that I always thought was cool was how at the end of the game, Elodie's information changes. At the coronation scene right before she is crowned, the information says "Crown Princess" and changes to "Queen" when the priestess names her queen. It's a really tiny detail, but I thought it was cool. Mir wrote: I don't know what kind of epilogue you get if you delay your wedding with Banion. I tried a delayed marriage to Banion but I'm getting the Earl of Pastries. Is the implication that their engagement got broken off at some point or is this a bug like with Talarist (the reason I ask)? Tsunamiracle wrote: Another Fun New Epilogue I finally figured out how to get gives some in-game proof that Lucille intended to kill Laurent, too. Oooh, how'd you get that? To get that, I had to kill Lucille at the grand ball, hire Sabine as a spy, and keep Charlotte alive. In the epilogue, Lucille's journals are retrieved and decoded, revealing that she planned to kill Elodie and Laurent. I'm not sure if Ciphering is needed, too? (I leveled it up anyway because I needed general Intrigue for Sabine, but I forgot how much I had.) I just went by the list of new things in the update, which mentioned using Sabine*. I remember there being an old comment about this on a thread here, but it's nice to have something in-game that explicitly confirms it. I learned the other day that you actually have to become a Lumen in-game to actually get the high Lumen approval epilogue. I mean, putting it like that makes it seem obvious, but I was wondering if I could potentially get the ending by putting off bonding with the crystal, winning the naval battle, and printing Lumen propaganda. But...unless you're actually trying to chip away at the enemy fleet with your magic to achieve your glorious victory, that propaganda just isn't enough.